Tom has been leading these popular holidays since 2002, and delighted participants are making return trips. Leave your car behind and escape to the remarkable Isles of Scilly, some 28 miles beyond Land's End, for a relaxed, friendly and informal holiday. You will explore, on foot, thousands of years of richly varied human presence on this intimate and ancient part of granite Britain. 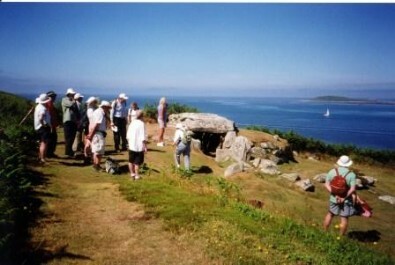 Scilly comprises an archipelago of five inhabited islands with scores of uninhabited ones. 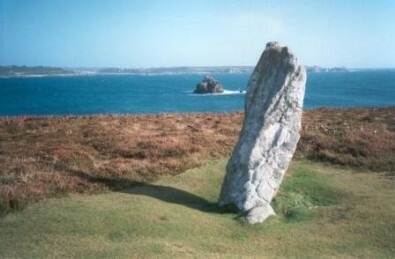 It is renowned for a number of spectacular prehistoric graves, including the site of the recently discovered Bryher sword and mirror burial. Tresco Priory, chapels and churches echo a special Christian presence extending back more than 1,600 years. Castles and other fortifications include those that witnessed the very last phase of the English Civil War. Tinworking and stonecutting also have a presence. All these elements are bathed in a breathtaking quality of light, set in a context of birds, flowers, seals and sandy beaches, which create a unique experience for the visitor. Enjoy your evening meal at St Mary's pubs, restaurants or hotels, or take a boat trip to St Agnes for supper at the Turk's Head, weather permitting. The package includes 7 nights bed & breakfast, packed lunches on full day excursions, all boat trips to the off-islands, entrance to Tresco Abbey Gardens and guided exploration and interpretation of the islands with the holiday guide. You will need to bring stout footwear and waterproofs. It is also advisable to bring a small rucksack for your packed lunches, a flask – and don't forget your sun lotion, binoculars and camera! Details from which to make your own travel arrangements will be sent to you when they become available. Maximum of 12 participants (minimum of 8 required). Group bookings from walking groups, ramblers, friends etc welcome. A different week from the one advertised could be accommodated for groups. ‘Many thanks for the wonderful, informative guided tour of the stunningly beautiful Isles of Scilly - we had a fantastic holiday'. C & J S, Hertfordshire. ‘What a truly memorable week... the scenery was wonderful, the information fascinating and the company congenial. I hope we shall return soon'. J & G B, Devon. ‘A massive thank you... we had a wonderful time walking, relaxing and socialising, and with all the historical and archaeological information, it truly brought the Isles of Scilly to life. T & B W, Devon. *Please note that only a few single rooms are available. Once these have been filled, a single room supplement, regretfully, will have to be charged.